One of the great ironies of the Climate Change Conference taking place in Copenhagen is that its focus is on “global warming” at a time when Planet Earth has been in a cooling cycle for the passed decade. That fact alone is testimony to another one; the United Nations conference has nothing to do with the climate and everything to do with a binding treaty that would ultimately transfer power from the individual sovereign nations whose representatives are attending to centralized governance by unelected bureaucrats. Just as Communism concentrates all power in the “State” and relegates its citizens to “property” of the state, the UN Climate Change program would subjugate entire nations in the name of “saving the Earth.” It needs saving, but not from a fraudulent “global warming”. The present greatest danger to mankind is the various power centers represented by the delegates to the conference. There is, however, another danger and it is the climate; not a warming one, but one that is at the tail end of the latest interglacial period between ice ages. The last ice age ended about 11,500 years ago, though some argue it was only 10,000 years. The late Dr. Theodore Landscheidt, founder of the Schroeter Institute for Research in Cycles of Solar Activity in Waldmuenchen, Germany, was a giant in the field of climatology. This science looks at climate trends in terms of millions or thousands of years. Before his passing in 2004, Dr. Landscheidt predicted a new Little Ice Age similar to what the northern hemisphere experienced from around 1300 to 1850. He based this on an analysis of the sun’s activity in the last two millennia and he believed it would arrive by 2030. Meteorologists are in general agreement that the current cooling cycle will continue for another two decades. Thereafter it gets really cold! Meteorology is about the weather that is occurring now and predicting what that weather will be in the near future. As we know, even short range predictions of a few days are subject to variations. Modern meteorology depends on computer climate models, but none can factor in the role of clouds on the weather because they remain a mystery. Other unknown factors include countless active undersea volcanoes. Winter will grow colder and last longer. By 2030, people in the northern hemisphere will experience what occurred between 1300 and 1850. History is filled with examples from the devastation of Napoleon’s army when he invaded Russia to Valley Forge in America. In England, the Thames froze over. My friend, Robert W. Felix, the author of “Not by Fire, but by Ice” and editor of the Internet site, www.iceagenow.com, has been predicting not just a Little Ice Age, but a full-fledged Ice Age like the one that occurred about a million or more years ago and did not end until about 10,000 years ago. Civilization as we know it is relatively new. Homo sapiens, humans, began their dominance around 10,000 years ago and the development of agriculture and other aspects of modern civilization are only about 5,000 years old. When you stack that up against vast epochs, it is a historical blip on the radar screen. Not that long ago in America, the only means of transportation were horses. What is occurring in Copenhagen is an obscenity. The fact that the President of the United States and other world leaders would attend and endorse its lies calls out for a massive repudiation. The “science” on which it is based has been revealed to have been deliberately falsified by the Climate Research Unit of the University of East Anglia and we may yet confirm that even NASA’s and NOAA’s data was inaccurate as well. As the White House and Congress try to impose a “Cap-and-Trade” bill, a huge tax on all energy use, on Americans, what scientists have been trying to explain for years is that no evidence exists that carbon dioxide (CO2) effects global temperature. This puts the lie to the Environmental Protection Agency’s announcement that it intends to regulate CO2 emissions in order to avoid a global warming that is not happening or that CO2 poses a health risk. We are witnessing gangsterism masquerading as regulation. There isn’t even evidence that CO2 is a so-called “greenhouse gas” or that a greenhouse effect even exists. There is no evidence that the seas are rising at an alarming rate or that glaciers and polar caps are melting. The United Nations Intergovernmental Panel on Climate Change, the sponsor of the Copenhagen conference, should be disbanded for being nothing more than a political instrument intended to coordinate a massive international fraud. All U.S. legislation based on “global warming” or “greenhouse gas emissions” should be repealed. 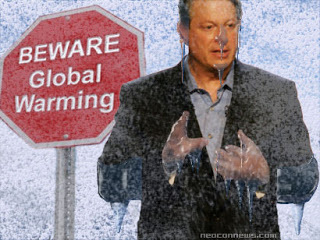 The worldwide mass media’s self-inflicted damage to its credibility requires a major effort to report the actual science and prepare the Earth’s population for some ugly consequences of the cooling that is occurring and is likely to accelerate in the decades immediately ahead. It’s going to get colder and all the lies flowing from a morally debased United Nations will not change that. Caruba blogs at http://factsnotfantasy.blogspot.com. He is an author, business and science writer. Thank you for being a great voice of reason Alan. Next Next post: Sarah Palin reacts to Climategate: "The President should boycott Copenhagen"